What are the chances of getting a parking ticket in Chorley's villages? Do drivers think there is no risk of getting a parking ticket in Chorley's villages? Problem parking in Chorley’s villages will only be solved if wardens are sent out to patrol during the evening, councillors have said. The call came at a meeting of Chorley Council’s liaison committee which heard that 60 recent visits to the borough’s outlying areas by enforcement officers had resulted in just one fine being issued. “Between 9am and 5pm, there’s barely a car to be seen in the villages – but if you go out after 6pm, you can hardly get by for vehicles parked on the pavements,” committee chair Gordon France said. Lancashire County Council, which is responsible for parking patrols, said it is planning to carry out evening visits to selected villages – but Chorley Council leader Alistair Bradley called for all parking enforcement in parish areas to be transferred to his district authority. “We could use a roving team going round different villages at different times – and if people don’t know when it’s coming, then it would keep them on the hop,” Cllr Bradley said. But one committee member warned councillors and residents to be careful what they wished for – and said overzealous action could “ruin” some villages. “People want yellow lines and they want people to stop parking on footpaths – but that doesn’t make sense,” Cllr Eric Bell said. “If somebody is blocking a footpath, then by all means take action. But if you didn’t park on the pavement in somewhere like Whittle, then buses and delivery vehicles wouldn’t get through. “Drivers just need to slow down,” he added. Parking wardens can only issue tickets if restrictions like waiting times have been breached. Parking which has caused an obstruction can only be dealt with by the police. 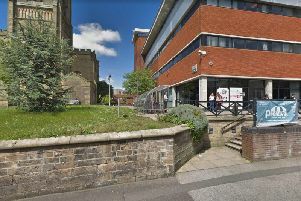 The meeting heard that some Chorley village residents had been embroiled in “heartbreaking” disputes with neighbours over parking. “Sometimes it involves disabled parking bays and people who are quite vulnerable and can’t assert themselves,” committee member Julia Berry said. In a statement issued after the meeting, a spokesman for Lancashire County Council said: “Our enforcement of parking restrictions is focused on busy town and city centres where poor parking has the greatest impact on traffic and safety. “However our officers do visit villages on a cyclic basis, and we carry out targeted enforcement in the evenings as resources allow. We are planning to visit Briscall, Withnell and Wheelton during the evening in the coming month. PAVEMENT PARKING – WHAT ARE THE RULES OF THE ROAD? It is not currently illegal to park on footpaths – except in London – according to the RAC. However, the Highway Code advises drivers that they “should not” do it. It is an offence to leave a vehicle in “a dangerous position or where it causes any unnecessary obstruction of the road”. The government carried out a review last year which considered extending a pavement parking ban to all parts of England, but the results are yet to be published.